Viewing topic "Work-around for broken stop button"
So I’m wanting to sequence on my mo6 but my stop button has stopped working, I know I can set the foot switch to start/stop the sequence but then I do not have a sustain pedal. I’d get the board repaired but I need to use it in an upcoming gig and would like to setup a few sequences for it. Any suggestions for a work-around that still allows me to use a sustain pedal? Also is it likely that I can get this button repaired when I do have time? Any suggestions for a work-around that still allows me to use a sustain pedal? Are you using the FOOT CONTROLLER input? If not, you can set it to CC#64 (Sustain Sw) and use a pedal in that input. Then the FOOT SWITCH can be set for sequencer Play/Stop operation. If that’s not practical, do you have a way to send MIDI messages to the MO6? If so, sending System Real-time Message FC (hex) will stop the sequencer. Also is it likely that I can get this button repaired when I do have time? Probably, especially if the problem is with the STOP switch itself. There are other possibilities, some of which might become expensive to repair. O tried switching my sustain to the foot controller but it wouldn’t let me use it, what sort of pedal would I need to purchase to be able to use the foot controller as a sustain? Also it seems like the foot controller function is set on the voice level, is there any way to set it universally for all voices? The FOOT CONTROLLER input is designed for a continuous controller, such as the Yamaha FC7, not a foot switch. The Foot Controller assignment in Song Mixing Edit and Performance Edit modes can be made as described for [F4] CTL ASN on pages 191 and 173 of the MO Owner’s manual. Unfortunately, although the MO Data List indicates CC#64 is both transmitted and recognized, it appears from the MO Owner’s Manual that setting the Foot Controller to that CC# only allows the MO to transmit it via MIDI to external devices - it’s apparently not received by the MO itself when the pedal is used. Since the MO will respond to CC#64 when it’s sent by an external MIDI device, you might consider getting a MIDI foot controller. You’re welcome. I hope the additional information will allow you to come up with an acceptable approach for the problem. Do you have any suggestions for a midi foot controller that would work? I’m new when it comes to this sort of stuff so all your help is greatly appreciated! ...which can be programmed to provide the FC/Stop message or CC#64/sustain, among many other MIDI messages. Are you going to need this for use during the gig, or just while creating sequences for the gig? Thanks a ton man! i wanna play vocoder synth over the sequences at the gig so this will work until I can get it repaired. Mainly need to be able to use the sustain while I’m tracking. Mainly need to be able to use the sustain while I’m tracking. 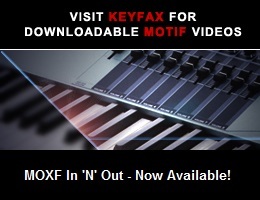 You might be able to avoid buying anything, if the MO is interfaced to a computer via MIDI. You could then leave the MO Foot Switch set to sustain, and just use a MIDI utility to send the FC message when you need to stop the sequencer. MIDI-OX (http://www.midiox.com/) is one such utility. Wow man, I’m getting somewhere now. So I hooked the keyboard into the computer and set it to usb midi. I’m now able to send the FC command with Midi-ox!! One problem though, when I try to sequence multiple tracks with pattern mode, it plays back all the tracks with all the sounds (as opposed to just using the sound set in the mix for the corresponding track).